"When Jeanette shares her 'vintage finds' with you she doesn't show you what they look like when she brings them home. 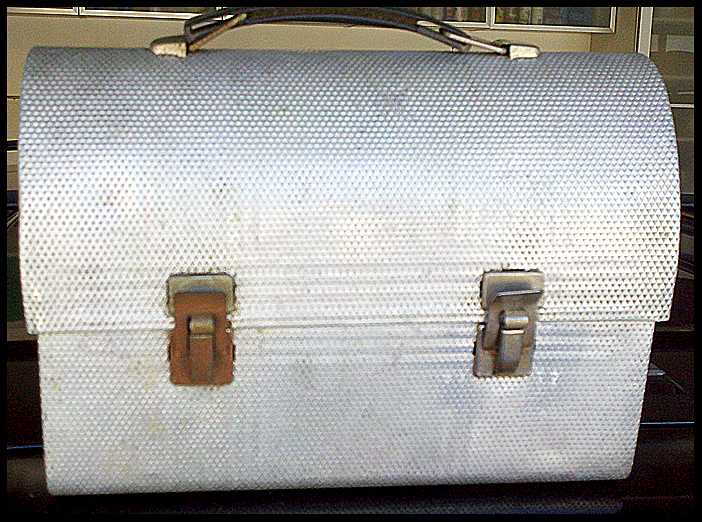 Take note of the rust covered hinge on the left side of the above lunchbox; that is how she brought this thing home. The one on the right is after I used steel wool to remove the rust. When she finds these things she often says something about how 'we' can just fix this or that. We both know who that 'we' is..."
Let's all have a great week - seeing as I ended last week with a giveaway win from Brooke over at S + B (which I read about on SilverStrands), I can't wait to see what this week might have in store for me. Thanks Brooke! This is too funny. Whenever I have a project, I also involve the we. My husband just rolls his eyes and helps. So that's where I go wrong in my trying to buy things and make them look cool - not having a Henry! Haha! I always say "we" when I really mean "he". Happy Monday! There is a we... Jeanette sees the possibilities and you are the possibility maker ! We - love it! And this brought back memories as my father used to carry a box just like this one! Ha!! Chuckled when I read this one!! oui! that of course means YOU. Lucky to have such a (willing) handy man around!